Low silhouette design to fit easily under tent campers and other RV’s with minimal ground clearance. Weight Empty: 17 Lbs. and Full: 145 Lbs. 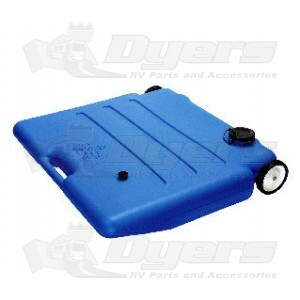 Equipped with 3” male bayonet outlet, 3/4” garden hose outlet and heavy-duty wheels. Comes complete with 3” bayonet cap and adapter, 18-5/8” I.D. drain hose, tow bracket and 3” sewerhose. Height of Tank Body: 6"
Height to Fill Cap: 7"
The tank is very well built. The tank is exactly what I needed for my tent trailer. The tank and wheels are well built, I expect to get many years of use from it. I have a custom made camper that rides low. My other sewer buddy was too tall and disconnecting it was a messy job to say the least. This one is only as tall as the wheels, very short. Works perfectly for my application. Shipping was fast, sales transaction was seamless. I will definitely do business again.